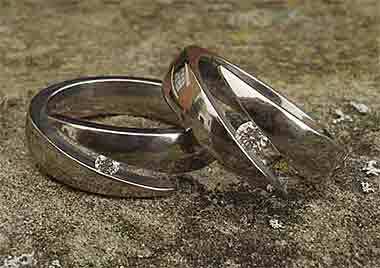 TITANIUM ENGAGEMENT RINGS : LOVE2HAVE in the UK! The BEST! British made titanium engagement rings with large diamonds that sparkle and at the lowest prices. When a smaller diamond won't do, and your budgets stretched, it is time to consider titanium as the perfect alternative to much more expensive precious metals such as gold. Titanium indeed is among our generation's most significant contributions. No element has ever impacted such a broad scope of industry nor benefited humankind as significantly. It is down to these facts that the types and varieties of engagement rings have increased considerably over the years due to the discovery of this newer lightweight metal. New possibilities in engagement ring design are available for designers to readily experiment with such as the tension set titanium engagement rings. Titanium has many advantages over gold. As it is a colourless metal, its appearance is the same as that of a plated white gold ring. The main point here to note is that a gold ring would be over double the price at least, making diamond engagement rings far too expensive for most of us. A titanium diamond engagement ring will give you much more value for money in the long run. An absolute must for every engagement ring is the stone and compromising on size is not an option. We sell a range of engagement rings made from titanium with quarter carat diamonds, just enough to impress, and not enough to break the bank. When nothing else will do other than a quarter carat (0.25 carat) diamond for an engagement ring for her, then you have come to the right page to find one. A diamond can never be too big when it comes to engagement rings, but the expense of larger diamonds can be astronomical. For example, you would be looking at a four-figure sum for an engagement ring like these made from gold and set with a diamond of this size and quality, so this is where our titanium engagement rings can save the day. Not only does titanium look good, but it is also cheaper too. The fact is that most of the price on one of these titanium engagement rings will go on the diamond itself. Our tension set titanium engagement rings are designed to hold the diamond securely once it has been tension set into the titanium ring. Tension setting a diamond allows the light to pass through it and permits the diamond to sparkle. Because our expert jewellers always use SI quality stones, this means the ring will shine, but at the same makes these engagement rings very affordable. Nothing on our website is imported or made abroad. All these titanium engagement rings are designed and manufactured here in the UK with a passion and to the very highest of quality and craftsmanship. We offer a full guarantee in both price and an after sales service should you require it.